We all happen to be a spoilt brat of the modern generation when it comes to technology. As everything is going digital, there is no reason to let yourself do the effort when you can just make the job done with your fingertips. As for fishing, you can still say the same. So we would like to draw the attention of all the fishers out there who would love to take the technology to other levels. Thus, warm up yourself, because we have come up with a fishhunter pro review, a device that is just there to smoothen your fishing experience. And this fishhunter pro review will light up all the features that the device tends to carry. Let’s start the fishhunter pro review with just what is it all about. So, this little thing is a device which you can call a fish finder as well that does the job of finding the fish. It is a wide-ranging underwater scanning device that will help you identify and locate big schools of fish so you can easily spot them. However, you will need to install the FishHunter app from either the Android or iOS. Following to which it will connect to your phone via Wi-Fi or Bluetooth. The FishHunter pro has numerous nifty features. With the RAW view, it will produce actual results from the transducer so you can have sonar feedback which is the plain, traditional sonar view. So, this view will let you show everything as captured via sonar scan. Moreover, this mode provides you with the highest detail. Thus it becomes easy for you to pick apart anything that’s happening down there. Via switching to FISH view, you can collect the RAW sonar data and reconfigure it on the app. This mode lets you find fish in the simpler way as it draws a simple view of a water column. Moreover, this mode also lets you show a fish icon with a depth reading to let you know the presence of the fish. So, it will not confuse the fisher who is new to the field. Moreover, the device can also function as an ice fishing flasher. it happens to give you more detailed feedback with using dual beam sonar of 475 kHz and 675 kHz. Additionally, you do not even have to worry about the device getting damaged for the low temperature as it has the capacity to withstand weather conditions as cold as -22 degree F (-30 degree C). As fishhunter pro review is all about the device, you should also know about the performance of this little guy. The FishHunter pro uses a high-quality Tri Frequency transducer that operates on different frequencies ranging between 381 kHz, 475 kHz, and 675 kHz. It helps you go closest to CHIRP sonar thus give you sonar feedback in high definition. So if you have the one with higher frequency, you will be able to get the most accurate readings. On the flip side, if you are fishing in deeper water, you would want your frequency to be lower as it will give you a clearer picture. Fishhunter boasts to be pretty powerful as it offers 4 times faster display action of up to 150 ft.depth range and 160 ft. width beam. Additionally, you would need to place it in at least 4 ft. of water if you want it to function. However, if you are wondering about the health of the battery, then allow us to let you know that this device uses a Lithium Polymer battery. It’s a battery that comes with a life expectancy of around 10 hours. Thus, it’s more than enough to provide all the power it has in its bag. However, as power is one of the essential elements for the fish finder, it will deliver all the information that you need for fishing. It lets you find the fish in the most simple way. It features a great app interface with tons of user community whistles. It has a flashing light on top that keeps the unit in sight. It’s easy to move with it and store it. It will notify you when the fish appears around your sonar net. The unit comes in heavy with 5.5 ounces. You will need 4 hours initial charge time. New fisher will not understand the RAW mode. You might have some intermittent connection drops. Q: What is the difference between Fishhunter Pro and the Fishhunter 3D? A: The Fishhunter pro is a scrolling 2D visual while Fishhunter 3D provides you a three dimensional visual of what’s under the water. Q: Will the device work on no phone service? A: Yes, the app will work with no phone service since its sonar has a Wi-Fi chip in it so that it connects to your phone and work. Q: Does it show the relative size of fish? A: Yes, the size of the fish is represented by the size of the fish outline. Q: Can you cast this out on a fishing pole? A: Yes, you can cast this out on a fishing pole. Q: Does it work well on moving water at shallower depths? A: Yes, It works well in depths greater than four feet. So, there is nothing to be fishy regarding the device being one of the top fish finders. Since it does all the job in the simplest way, people from the beginner to pro in the fishing field can easily find the fish. 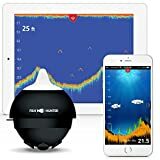 We hope that this fishhunter pro review helps you find the answer and the fish as well and with this device we hope you have a happy fishing moment.